Shuffle is the world’s first and only Digital Relationship Maker (DRM). Our simple, mobile app instantly bridges the gap between your offline introductions and online relationships. The most important moment for every business relationship is the introduction, so make a lasting first impression with Shuffle! 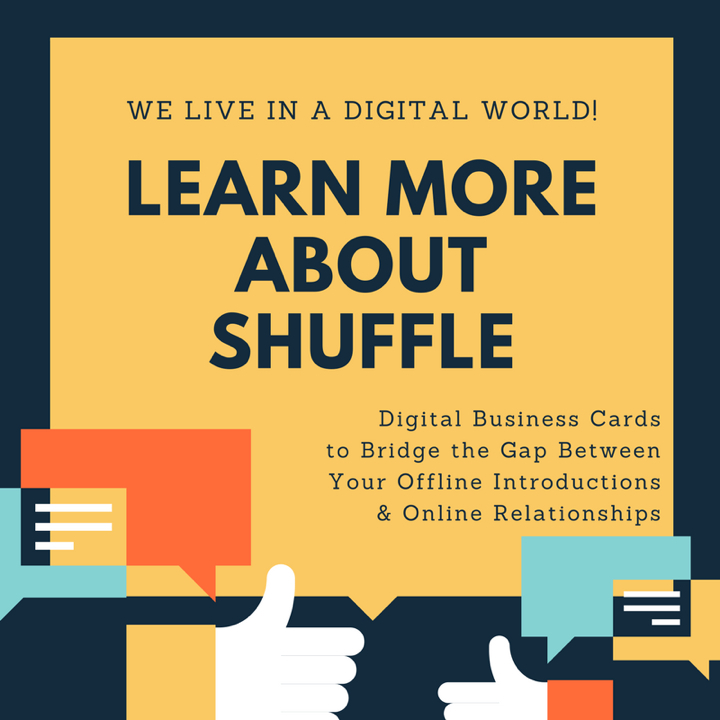 From your beautifully designed digital cards, to your important business follow ups, Shuffle’s DRM gives you a seamless, mobile solution made for networking in the 21st century! So why are you still introducing yourself with a piece of paper and tracking your prospects manually? It’s time to upgrade your business interactions! Instantly digitize your relationships by sharing your Shuffle Card instead. Engage your prospects with links to your websites, social media pages, and embedded videos right on your card. Then, Shuffle’s revolutionary follow up reminders ensure that no one falls through the cracks… EVER. Save contact notes and always remember the important details of your interactions. Plus, get notified every time contacts view your Shuffle Cards.